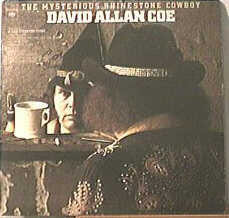 The Mysterious Rhinestone Cowboy is the third album of American singer David Allan Coe, and his first on Columbia Records. 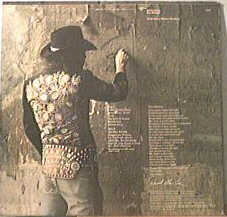 Released in 1974, it is his first release in the country music genre. David Allan Coe’s debut album for Columbia proves beyond the shadow of doubt that he was the original alt-country antihero. Released in 1974, Coe revealed an adopted persona: The Mysterious Rhinestone Cowboy. He was equal parts hell-raising biker ex-con (this aspect was accurate); a pre-punk badass full of piss and vinegar, spewing vitriol (and bad humor) at the Nash Vegas establishment (and anyone who didn’t like his music); a hillbilly version of Marc Bolan’s glitz and glitter; and a sensitive country singer and songwriter heavily influenced by Merle Haggard, as good as anybody at his best — and that includes Willie Nelson, Waylon Jennings, Billy Joe Shaver, and Kris Kristofferson, to name but a few. Opening with “A Sad Country Song,” Coe displays his lyrical and melodic gift that comes out of the great Texas and Bakersfield traditions. Amid a whining pedal steel, shimmery fiddle, and a waltz tempo heard above the guitars, Coe sings to the lonely and alone and offers his brand of empathy this way: “Just look for my name on a jukebox/When you’re tired of being alone/Put in a dime and I’ll take the time/ To sing you a sad country song.” On the very next track, producer Ron Bledsoe borrows textural ideas from Mickey Newbury’s recordings and Scott Walker’s delivery on Michael Smith’s folk classic “Crazy Mary.” And speaking of Newbury, Coe’s reading of his “33rd of August” is reverential but not to the point of mere imitation. The rain and thunder sounds are kept as essential elements of the song’s composition. Coe understates his beautiful baritone in homage to Newbury’s own considerable gift for understatement. Other Coe signature tunes like “I Still Sing the Old Songs” and “Atlanta Song” are recorded here for the first time, along with a killer cover of Guy Clark’s “Desperadoes Waiting for a Train.” Unlike later Coe recordings, there are no novelty tracks here, and as a label debut this is as auspicious as it gets.